LUCENA CITY - A former drug detainee died after he engaged in a shootout with police operatives during a drug buy- bust operation at Bgy. 11, here, on Wednesday night. Quezon police director, Senior Supt. 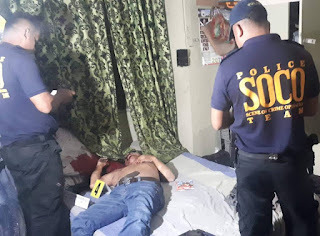 Osmundo de Guzman identified the slain suspect as Ramon Pansacola Sotelo, 57, resident of saisld village and included in the city police’ drugs watch list. De Guzman said the incident happened at 7:15 while Drug Enforcement Unit operatives of Lucena City police station under Supt. Reydante Ariza were conducting a drug bust operation whose target was Sotelo himself. Quoting Ariza in his report to Calabarzon police director, Chief Supt. Edward Carranza, De Guzman said the operatives who pretended to be drug buyers were able to buy suspected drugs to Sotelo. “But when the operatives were about to collar the suspect, the latter quickly resisted and engaged the cops in a shootout using a cal. 38 revolver”, said De Guzman. He said the suspect ended up dead as he traded bullets with the cops. Personnel of Quezon Provincial Crime Laboratory Office led by Senior Insp. Dickson Mercado who processed the crime scene recovered the Smith & Wesson cal. 38 revolver used by the suspect, three empty shells for cal. 9mm pistol four small sachets containing suspected shabu.